ROCHESTER, N.Y. -- The Rochester Red Wings out-slugged the Louisville Bats 13-6 Monday night at Frontier Field. The series continues Tuesday morning at 11:05 a.m, another Fan 4-Pack game with four tickets, hot dogs, drinks and a yearbook for $40 ($44 day of game). In the bottom of the fourth, the Red Wings gave starting pitcher Zack Littell more room to work with, as Jon Kemmer started off the inning with a walk. Due to a throwing error to third base, Kemmer scored from first on a single by Jordan Pacheco, which gave Rochester a 3-0 lead. The error allowed Pacheco to advance to third base on the play. The following batter, Zack Granite, hit a sacrifice fly to score Pacheco, making the score 4-0. The fifth inning was a wild one, with a total of 23 batters, 13 runs scored, and 11 hits. The Bats scored five runs to take a 5-4 lead, with a three-RBI double from Brandon Dixon the big hit. Gabriel Moya came on in relief for Littell in the fifth inning. Littell went 4.1 innings, allowing five runs on five hits, while striking out five and walking four. Littell threw 83 pitches, 53 were for strikes. The Red Wings came right back with eight runs in their half of the fifth inning. After two consecutive singles by Petit and Kennys Vargas in the bottom of the fifth, Mella came out of the game. Mella pitched 4.0 innings, allowing six runs (five earned) on seven hits, while striking out two and walking three. Mella threw 93 pitches, 48 were for strikes. Wade then worked a walk against new pitcher Brandon Finnegan, and all three base runners were brought home on a grand slam by Andy Wilkins in his debut with the team. The Wilkins slam gave Rochester an 8-5 lead. 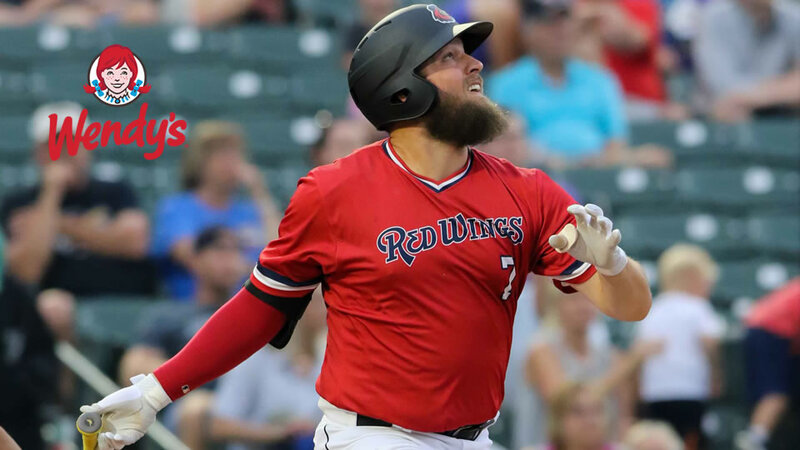 The Red Wings continued to put runs on the scoreboard, on an RBI double by Motter and later a wild pitch giving Rochester a 10-5 advantage. Even after a pitching change for Louisville, Rochester added another two runs onto their total, as Vargas hit a first-pitch RBI single to score Gordon. The hit allowed Petit to advance to second, and an RBI single by Wade made the score 12-5. In the bottom of the sixth, a single from Pacheco was followed by a single by Granite, and a fielding error allowed both baserunners to advance to third and second, respectfully. A wild pitch to Motter let Pacheco score, adding onto Rochester's lead to make it 13-5. Moya contributed throwing 1.2 innings, allowing two hits while striking out four. Trevor Mayfollowed Moya and struck out three in 2.0 scoreless innings, and Nick Anderson pitched the ninth inning, Anderson allowed a solo home run to Phillip Ervin, but struck out the side to close out the win.